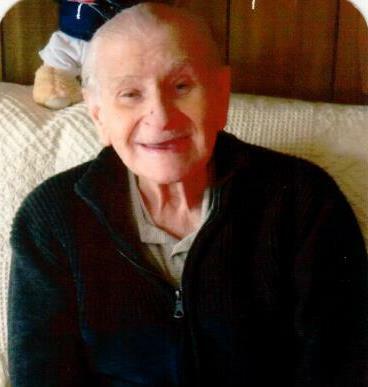 Arthur “Archie” Ferreira 96 of New Bedford passed away Thursday June 21, 2018 at the Bedford Gardens Care & Rehab. He was the husband of the late Helen (Olejarz) Ferreira and son of the late Manuel and Estrella Maria (Reis) Ferreira. He was born in Oakland, CA and had lived in New Bedford for most of his life. He was a communicant of St. Mary’s Church in New Bedford. Archie was employed by Aerovox as a security guard until his retirement. He loved being with his family, especially with his great grandchildren and enjoyed working with his hands. Survivors include his son Arthur Ferreira Jr. and his wife Doreen of New Bedford, his sister Lillian Vanasse Silvia of New Bedford, his granddaughters Jackie Dupuis and her husband Wilfred, Jeanine Simmons and her husband Christopher, his great grandchildren Paige Dupuis, Courtney Dupuis, Wyatt Simmons and Morgan Simmons. He is also survived by several nieces and nephews. He was the brother of the late John, Sylvester, Lucille and Lucy Ferreira. His family would like to thank the nursing staff and CNA’S on the 1st floor at Bedford Gardens and also Beacon Hospice. His funeral mass will be said 10am Monday At St. Mary’s Church in New Bedford. Visiting hours are Sunday 4-8pm. Burial will be in Sacred Heart Cemetery.